Production: Metro-Goldwyn-Mayer Picture Corp; Technicolor, 35mm; running time: 112 minutes. Released 1953. Filmed in the MGM studios. Producer: Arthur Freed; screenplay: Betty Comden and Adolph Green; photography: Harry Jackson; editor: Albert Akst; production designers: Edwin Willis and Keogh Gleason: set designs for musical numbers: Oliver Smith; art directors: Cedric Gibbons and Preston Ames; music: Howard Dietz and Arthur Schwartz; music director: Adolph Deutsch; costume designer: Mary Ann Nyberg; dance direction: Michael Kidd. Cast: Fred Astaire ( Tony Hunter ); Cyd Charisse ( Gabrielle Gerard ); Nanette Fabray ( Lily Marton ); Oscar Levant ( Lester Marton ); Jack Buchanan ( Jeffrey Cordova ); James Mitchell ( Paul Byrd ). Astaire, Fred, Steps in Time , New York, 1959.
de la Roche, Catherine, Vincente Minnelli , New Zealand, 1959; reprinted in Film Culture (New York), June 1959. Springer, John, All Singing, All Dancing , New York, 1966. Truchaud, Francois, Vincente Minnelli , Paris, 1966. Kobal, John, Gotta Sing, Gotta Dance , New York, 1970. Thomas, Lawrence, B., The MGM Years , New Rochelle, New York, 1972. Minnelli, Vincente, and Hector Arce, I Remember It Well , New York, 1974. Delameter, James, Dance in the Hollywood Musical , Ann Arbor, Michigan, 1981. Mueller, John, Astaire Dancing: The Musical Films , New York, 1985. Thomas, Bob, Astaire: The Man, the Dancer , London, 1985. Drouin, Fréderique, Fred Astaire , Paris, 1986. Brion, Patrick, and others, Vincente Minnelli , Paris, 1985. Adler, Bill, Fred Astaire: A Wonderful Life , New York, 1987. Satchell, Tim, Astaire: The Biography , London, 1987. Harvey, Stephen, Directed by Vincente Minnelli , New York, 1990. Naremore, James, The Films of Vincente Minnelli , Cambridge, 1993. Jablonski, Edward, in Films in Review (New York), August-September 1953. Lambert, Gavin, Sight and Sound (London), January-March 1954. Chaumenton, Etienne, "L'Oeuvre de Vincente Minnelli," in Positif (Paris), November-December 1954. Bitsch, Charles, and Jean Domarchi, "Entretien avec Vincente Minnelli," in Cahiers du Cinéma (Paris), August-September 1957. Tranchant, François, "Invitation à la danse," in Image et Son (Paris), January 1958. Johnson, Albert, "The Films of Vincente Minnelli," in Film Quarterly (Berkeley), Winter 1958 and Spring 1959. Conrad, Derek, "2 Feet in the Air," in Films and Filming (London), no. 3, 1959. Minnelli, Vincente, "The Rise and Fall of the Musical," in Films and Filming (London), January 1962. Domarchi, Jean, and Jean Douchet, "Rencontre avec Vincente Minnelli," in Cahiers du Cinéma (Paris), February 1962. Torok, Paul, and Jacques Quincey, "Vincente Minnelli; ou, Le Peintre de la vie revée," in Positif (Paris), March 1963. "Minnelli Issue" of Movie (London), June 1963.
de la Roche, Catherine, "Vincente Minnelli," in Premier Plan (Paris), March 1966. Giles, D., "Show-Making," in Movie (London), Spring 1977. Mueller, J., in Dance Magazine (New York), May 1979. Johnson, Julia, in Magill's Survey of Cinema 1 , Englewood Cliffs, New Jersey, 1980. Polan, Dana B., "It Could Be Oedipus Rex: Denial and Difference in The Band Wagon ," in Ciné-Tracts (Montreal), Summer-Fall 1981.
de Kuyper, Eric, "Reflexions on the 'Dancing in the Dark' Sequence from Vincente Minnelli's The Band Wagon ," in Wide Angle (Athens, Ohio), vol. 5, no. 3, 1983. Damisch, Hubert, "Un trouble de mémoire au cinéma," in Cinémathèque , no. 7, Spring 1995. Saada, N., "Howard Dietz et Arthur Schwartz: The Bandwagon ," in Cahiers du Cinéma , Hors serie, 1995. Mueller, J., and G. Aachen, " The Band Wagon ," in Reid's Film Index (New South Wales, Australia), no. 32, 1997. The Band Wagon represents one of the most important of the MGM musicals of the 1950s, indeed in the history of this Hollywood genre. In particular, The Band Wagon stands as one of the masterworks to emerge from the very productive musicals unit that producer Arthur Freed controlled at MGM during the late 1940s and early 1950s. The Band Wagon gestated in producer Freed's mind late in 1951. With recent successes of An American in Paris and Singin' in the Rain , Freed had the idea to acquire a song catalogue as the basis for this musical, in particular the songs of Howard Dietz, and his longtime partner Arthur Schwartz. Freed appreciated the creators of songs, having joined MGM as a song writer himself twenty five years earlier. By the time of The Band Wagon he had turned full-time to producing, winning every possible award offered in the Hollywood. Of the films he would produce in his long, distinguished career, none would be greater than The Band Wagon. Freed took "I Love Louisa," one of Schwartz and Dietz's hit songs, as the original title of his new musical and set the vast talents of MGM in motion. This meant first screen writers Betty Comden and Adolph Green who had penned Take Me Out to the Ball Game (1949), and Singin' in the Rain (1952), among other creations, at MGM. This also meant director Vincente Minnelli, who had long been an MGM stalwart since the successes of Meet Me in St. Louis (1944), The Pirate (1948), and An American in Paris (1952). Freed had hundreds of stars from which to choose. He selected the great Fred Astaire, who although more famous for his RKO films with Ginger Rogers, had been at MGM since the early 1940s. 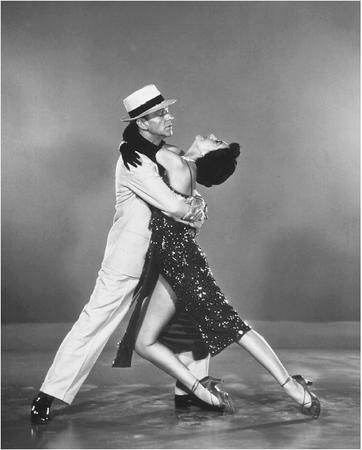 Astaire's dance partner for The Band Wagon would be Cyd Charisse, who had been featured in Singin' in the Rain the year before. During the first week of February 1952, Comden and Green commenced writing their original story and screenplay. (Eventually their script would include "themselves" in the form of Oscar Levant and Nanette Fabray couple, the principle difference being that Comden and Green were never married.) The story idea centered around "making a show," a classic narrative formula for the Hollywood musical. The Band Wagon made use of the audience's particular knowledge of the career of Astaire. For example, the film's credits are superimposed on a top hat, white gloves, and a cane, probably the most famous icons of the American musical, indeed representing to all the genius of Astaire. But when the film opens we learn that the top hat is for sale and no one will buy it. Is Astaire washed up? This enigma sets "Astaire," the man, the star, the legend, squarely in the middle of the story: can he (Fred Astaire/Tony Hunter) make a successful comeback? The Band Wagon script resolves this dilemma by having Astaire/Hunter failing to make art ("this show is a modern version of Faust "), but instead again creating wonderful entertainment for the masses. More than a dozen of the Schwartz and Dietz songs were used including "Something to Remember You By," "I Guess I Have To Change My Plans," "The Beggar's Waltz," "High and Low," and most recognizable of all, "Dancing in the Dark." The only original song, composed by Schwartz and Dietz in 1952, was "That's Entertainment," which later became the anthem for MGM's Golden Age of the musical. The rehearsal period for this complex dance musical began in August, 1952; and lasted six weeks. In the process the aforementioned talent created a serious of wonderful individual numbers on which the film's fame rests. For "Shine on Your Shoes," Astaire was assisted by LeRoy Daniels, a non-actor, and an $8,000 "fun machine" which sounded like a calliope, shot out flags, rockets, and a kaleidoscope of colors. "The Girl Hunt" ballet, the film's climax, presented a satire on the detective film with Astaire as the flat foot narrator, in slouch hat, dark shirt, and double breasted suit, the very antithesis of his classic top hat and tails. The Band Wagon ended shooting late in January 1953, nearly a year from the day Comden and Green sat down to create the story. The final cost of the film came to more than two million dollars. (Indeed the "The Girl Hunt" ballet cost more than three hundred thousand dollars alone.) The premiere, in late July, came to glowing reviews, and upon its initial release The Band Wagon more than made up for its considerable investment, and thereafter has generated considerable profits for MGM.